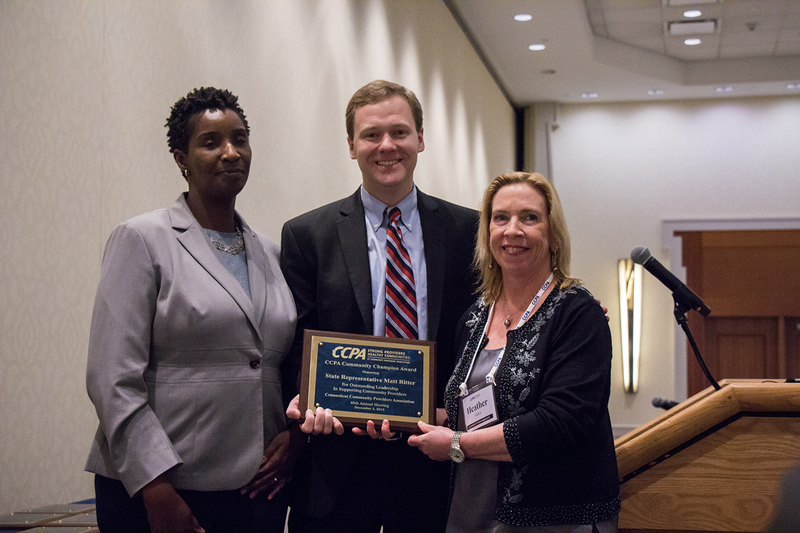 I am honored to be named a ‘2015 Community Champion’ by the Connecticut Community Providers Association’s (CCPA). Thank you CCPA for recognizing my continued efforts and support on behalf of non-profit community providers who serve Connecticut’s most vulnerable citizens. As Co-Chair of the Public Health Committee and a representative of Hartford, I have heard from countless Connecticut and Hartford residents who rely on the important and necessary services that our Community Providers deliver. I am happy to support their vital work in the legislature and am particularly touched to be recognized by the CCPA. Representative Matt Ritter has been a champion of services for the state's most vulnerable citizens, and we value that support now more than ever as the General Assembly works to address budget deficits and shortfalls. Representative Ritter has demonstrated time and again his understanding that the community provider network is both cost-effective and vital to the quality of life in our state and the Connecticut Community Providers Association is honored to present him with this award. The Connecticut Community Providers Association (CCPA) is the premier state trade association representing organizations that provide health and human services in the areas of mental health, substance use disorders, developmental disabilities, child and family health and well-being, and other related issue areas. To learn more about the CCPA visit www.ccpa-inc.org.